Use the gold-standard LinerGOLD™ GC Liners for consistently high accuracy, sensitivity, and precision in your gas chromatography (GC) analysis. Use these injection port liners to optimize performance of Agilent GC instruments. 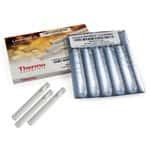 Ensure a high degree of reproducibility with Thermo Scientific Injection Port Liners with CarboFrit for Thermo Scientific Trace and Focus SSL Instruments.